Online dating may have landed you a date. Now that you have succeeded in getting a date with that special person online, it’s time to ensure that you are at your best. If you have really enjoyed your interaction online then it is best to keep up that momentum on your offline date. There are no guarantees that you will have the same chemistry offline that you did online but here are a few online dating tips that will help you leave a good impression on her during and after the date. Wherever you choose to meet your date, it is important that throughout the date you maintain consistent eye contact. This is a crucial online dating tip. Women love it when you look them in the eye. It’s not only a sign of respect but it also shows them that you are sincere. If you start getting distracted by what’s going on around you(especially by looking at other women), you are going to lose her. Focus on her and you will make her feel like she is the only person in the room. Women love guys who smile. Smiling is a big indicator that you are a genuine person. It provides an invisible window into you that tells her that you are a happy person. That type of persona can be very intoxicating. Take heed of this online dating tip and understand that some men can literally sweep women off their feet by their smile alone. This is a very important online dating tip. 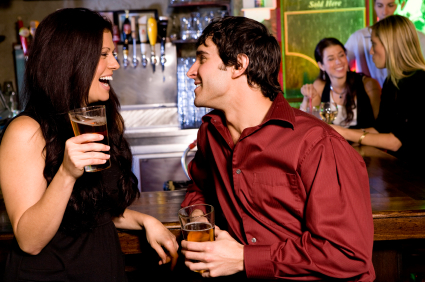 Some men fall into the trap of talking incessantly about themselves during a date. It leaves a bad impression on your date when she can barely get a word in. Let her do most of the talking and you the listening. Enrich the conversation by following up on what she says. This tells her that you have been paying attention. Women love good listeners and most people love to talk about themselves. Women love men with a sense of humor. For some women, the quickest way to their heart is by making them laugh. This is a powerful online dating tip. You do not have to be a comedian to do this. Simply relate something she told you to a funny story that occurred in your own life. Keep it short and make her laugh. Be as self-deprecating as you can without going overboard. This will show her that you are not only a fun person to be around but that you also don’t take yourself too seriously. If you decide to meet at a place that is indoors, ensure that you open the door for her to let her into the building first. Even though times have changed and society has evolved, most women will still appreciate a man that opens doors for them. Be sure to do this upon exiting the building as well. It’s little things like these that can take you a long way and impress upon her. One of the reasons why some men fail on their first dates is that they ignore the little things. Contrary to what some men may believe, women are not complicated when it comes to dating. Often it is those little things that some men ignore that can cause all the difference. No matter how much a man may try to impress on a woman with fancy restaurants or lavish escapades, it’s the little things that will win her heart. By walking on the street-side of the curb, she instantly knows what you are doing and feels not only secure but appreciative of your caring nature. Women love men that are respectful. If you walk her to her car, see that she gets in and drives away safely, she will feel very special. She will be smiling as she drives away already wondering what the next date is going to be like. It’s always a good sign when a date leaves smiling. These are a few online dating tips that will help you. Hopefully, the two of you had as much chemistry offline as you did online. Now, move on to that second date and many more.